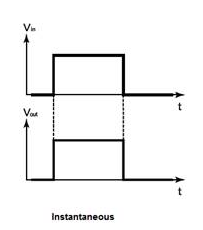 An Instantaneous Relay is one in which there is no time delay provided intentionally. As the current coil is an inductor, there would be a certain delay to reach the current in the coil to its maximum value. There is also some time required for mechanical movement of the armature in the relay. These time delays are inherent in the instantaneous relay but no other time delay is intentionally added. These relays can be operated in less than 0.1 sec. Contacts change instantaneously from non-working position to working position when its coil is energized; when the coil is de-energized the contacts are coming back instantaneously to the initial non-working position. -40 °C...+80 °C operating temperature.